Trump just announced tariffs on another $200 billion worth of Chinese goods -- here are all the products that will get hit. President Donald Trump announced tariffs on $200 billion worth of Chinese goods on Monday, escalating the US-China trade war. The tariffs will apply to a slew of Chinese goods, ranging from minerals to food to clothing. The US Trade Representatives office removed almost 300 items from an initial list released in July. But 5,745 Chinese goods will still get hit. We complied the major categories of goods that will be subject to the tariffs. 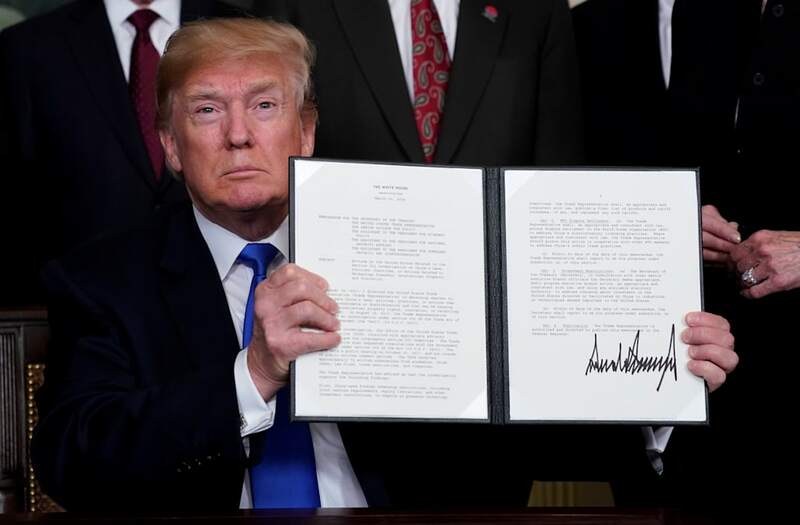 President Donald Trump kicked the trade war with China into high gear Monday, formally announcing the imposition of tariffs on $200 billion worth of Chinese goods. The tariffs cover a wide array of goods, from minerals used in manufacturing, to vegetable juices, to leather handbags. All of the goods with face a 10% duty until the start of 2019, when the tariffs will jump to 25%. While the Trump administration is downplaying the effect of the tariffs, many economists expect prices for these goods will increase once the tariffs are officially imposed on September 24. The new list of goods that will be subject to the tariffs was released by the US Trade Representative Robert Lighthizer's office on Monday. The final list is notably different from the previous round of tariffs on $50 billion worth of Chinese goods, because there are consumer products on the list. The previous round focused almost exclusively on industrial equipment and machinery, while the new round includes items like hats, TVs, and food. The USTR did not specify how it determined which products to remove beyond assertions that the official followed an inter-agency procedure and listened to feedback from businesses. The smartwatch removal drew interest after it was revealed that Apple, makers of the Apple Watch, directly lobbied the White House. Even with the removals, 5,745 full or partial tariff lines are included on the final list that represent roughly $200 billion worth of Chinese imports. Fish and seafood:live fish including ornamental fish, trout, eels, tuna, and carp; chilled or frozen meat of various types of trout, salmon, halibut, plaice, sole, albacore, tuna, herring, mackerel, cobia, swordfish, pollack, whiting, catfish, rays, and more; various types of salted or smoked fish; other seafood including various types of lobsters, crabs, shrimps, prawns, oysters, scallops, mussels, clams, squid, octopus, conchs, abalone, sea cucumbers, and sea urchins. Non-meat animal products such as eggs and dairy:Whey products; butter; various types of eggs including chicken; honey; hair of animals including human, hog, horse and badger; animal intestines, bladders; feathers; bones including shells, beaks, corals, hooves, antlers, and more. Vegetables:onions; garlic; cauliflower and broccoli; cabbage; carrots; turnips; radishes; beats; cucumbers; peas of various types; beans; lentils; celery; mushrooms; peppers of various types; squash; okra; sweet corn; potatoes; sweet potatoes and yams; some types of tomatoes; spinach; Brussels sprouts. Fruit and Nuts: Coconuts; cashews; almonds; hazelnuts; walnuts; chestnuts; pistachios; macadamia nuts; pecans; dates; figs; pineapples; guavas; oranges; mandarins; clementines; raisins; grapes; apples; pears; quinces; peaches; berries including strawberries, raspberries, cranberries, blueberries and others; bananas; a variety of dried fruits; peels of various fruits. Cereals: wheat, including durum wheat; barley; oats; corn; various types of rice; grain sorghum; buckwheat; quinoa; and more. Oil seeds: soybeans; seeds of sunflower, flax seed, sesame, mustard, poppy and more; planting seeds for certain crops; cocoas and mint leaves; and seaweeds. Breads and Pasta: uncooked pasta; various breads, pastries, cakes, and biscuits. Prepared vegetables and fruits: various vegetables and fruits previously listen in their prepared or preserved forms; various fruit jams including strawberry, pineapple, apricot, and more; peanut butter; various fruit juices including orange, pineapple, lime, grape, apple, and more. Other food items: soy sauce; condiments and seasonings; protein concentrates. Ores, slag, and ash: ores of iron, copper, nickel, cobalt, aluminum, lead, zinc, tin, chromium, tungsten, uranium, titanium, silver, other precious metals, and others; slag, various types of ash. Inorganic Chemicals: chemicals such as chlorine, sulfur; carbon, nitrogen, oxygen, and silicon; acids including sulfuric, nitric, and more; various types of fluorides, chlorides, sulfates, nitrates, carbonates, and more. Fertilizers: animal or vegetable fertilizers; urea; ammonium sulfate; sodium nitrate; and more. Essential oils, perfumes: perfume; lip or eye make up preparations; manicure or pedicure products; shampoo; hairspray; bath salts. Soaps and cleaning products: various types of soap; leather and textile treatments; polishes for shoes and furniture. Photographic goods: various types of photo plates; instant film; various types of film in rolls; various types of motion picture film. Plastics: vinyl flooring and other plastic floor and wall coverings; sausage casings; bags; gloves including baseball gloves; rain jackets; machinery belts. Rubber: latex; rods, tubes, and other products; conveyor belts; various types of transmission belts; various types of pneumatic tires; gloves; gaskets; dock fenders. Raw hides and leather: animal skins including cow, buffalo, sheep, goats, reptile; various types of leather made from cow, buffalo, sheep, goats, reptile; leather trunks and suitcases; leather handbags; CD cases; gloves including ski, ice hockey, and typical use; belts; fur clothing, incluidng artificial fur. Wood: fuel wood; charcoal; various types of wood including oak, beech, maple, ash and cherry; moldings; rods; particleboard; various types of plywood; doors; corks and stoppers; wicker and bamboo baskets. Paper: Newsprint; writing paper; vegetable parchment; carbon paper; self-adhesive paper; cigarette paper; envelopes; tablecloths; handkerchiefs; folders. Wool or animal hair products: cashmere; yarns; tapestries and upholstery. Cotton: fibers; thread; yarn; denim; satin. Stone, plaster, cement, asbestos: stone for art; marble slabs; roofing slate; millstones; sandpaper; floor or wall tiles; cement bricks. Ceramics: fire bricks; pipes; tiles; porcelain and china. Precious stones and pearls: industrial diamonds; silver and products made of silver; gold and products made of gold; platinum; palladium. Various metal products, tools, cutlery: industrial items made from lead, zinc, tin, and more; saw blades; bolt cutters; hammers; wrenches; crow bars. Electronics: vacuum cleaners; hair clippers; spark plugs; generators; bicycle lights; electric amps; television cameras; various types of TVs; video projectors. Vehicles and parts: axles; driving shafts; gear boxes; radiators. Ships and boats: sailboats; motorboats; canoes; yachts. Instruments for scientific or medical purposes: microscopes; cameras for non-art purposes; gauges for pressure, electrical currents, and more. Furniture, bedding, mattresses: car seats; wood chairs; furniture designed for offices, kitchens, and more; mattresses; chandeliers; lamps.